The Manufacturing Process and Troubleshooting Course is a comprehensive solid dose training course that has been in the making since 1977. Loaded with practical information on how tablets and capsules are made, it is designed for experts and novices alike, putting the entire manufacturing team on the same page. The participant will be able to identify machinery, why it is used, and what it does. In other words, the participant will be able to go into any facility and understand the equipment and process at a glance. This training event is a hands-on, step by step program, covering why…… (click to learn more). 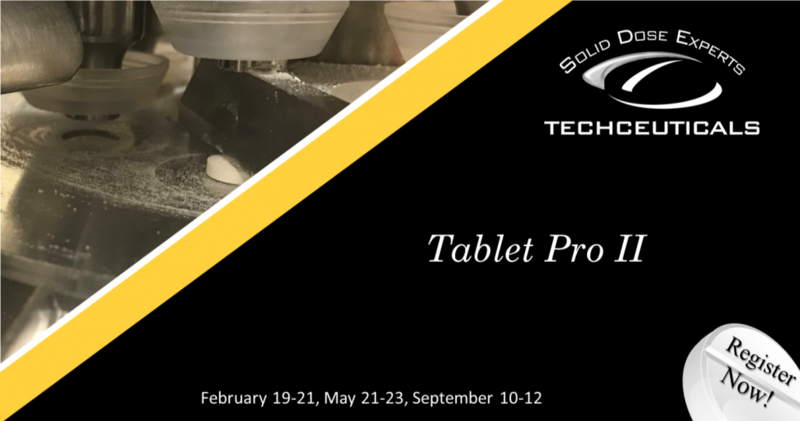 Tablet Pro II is a comprehensive hands-on seminar focusing on tablet making and the tablet making process. This course provides a comprehensive understanding of the processes that impact tablet production, including a hands-on session on how to set-up, operate, and clean a tablet press. Together with ways to solve common tablet defects, this training provides the basics about…(click to learn more). 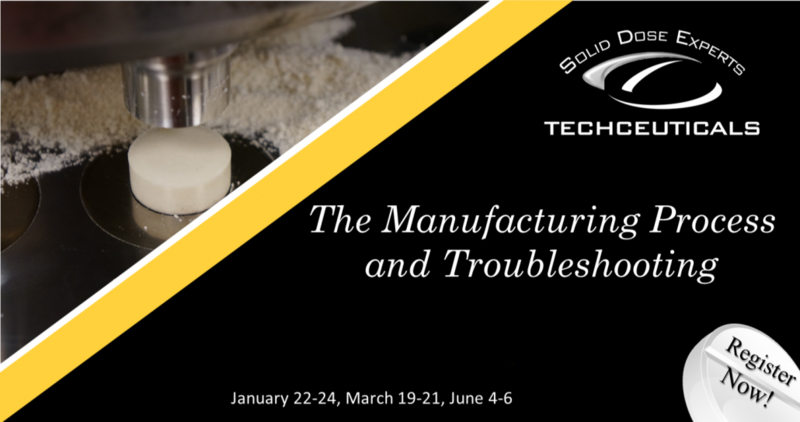 The Solid Dose Manufacturing and Troubleshooting is an expanded Hands-on version of The Manufacturing Process training program., we have added an additional day. This is a three and a half day comprehensive course covering the essentials needed to make quality tablets and capsules. The participant will be able to identify machinery, why it is used, and what it does. In other words, the participant will be able to go into any facility and understand the equipment and process at a glance. This training event is a hands-on, step by step program, covering why…… (click to learn more). Tablet Film Coating is a two-day event focused on the batch, continuous and Wurster technologies used to coat tablets, hard shell, and soft gel capsules. We will walk through the entire process of preparing the solutions, cleaning and setting up the equipment, calibration and run several batches of different tablets and capsules. We will provide an explanation of each step in the process, common terminology, and provide practical knowledge of…..(click to learn more). Encapsulation is a two and one half day training event is all about two-piece hard shell capsule filling. We will be featuring common equipment used in the encapsulation of pharmaceutical and dietary supplements capsules. We will focus on a step by step explanation of each unit operation within the manufacturing process, common terminology, and practical knowledge of each topic. Hands-on breakout sessions will be part of this course! (click to learn more). 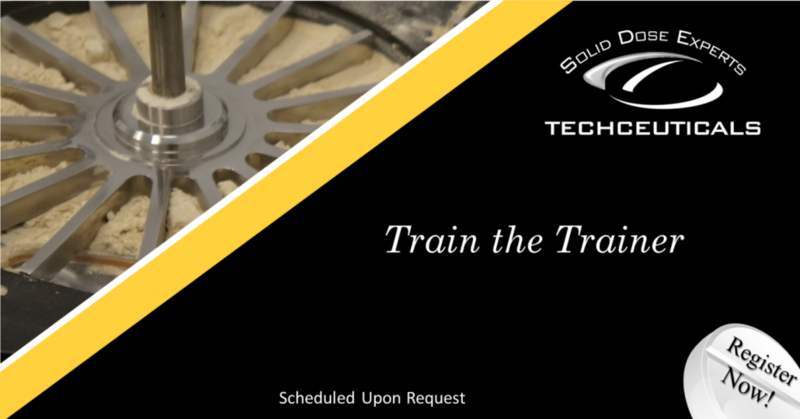 Train the Trainer is based on our flagship The Manufacturing Process and the in-depth Tablet Pro II training programs. Your company can now qualify a company trainer to be certified to deliver this program at your facility for new employee onboarding and for experienced employees alike. Once certified your trainer will be certified to train at your company with Techceuticals provided training and testing materials. (click to learn more). 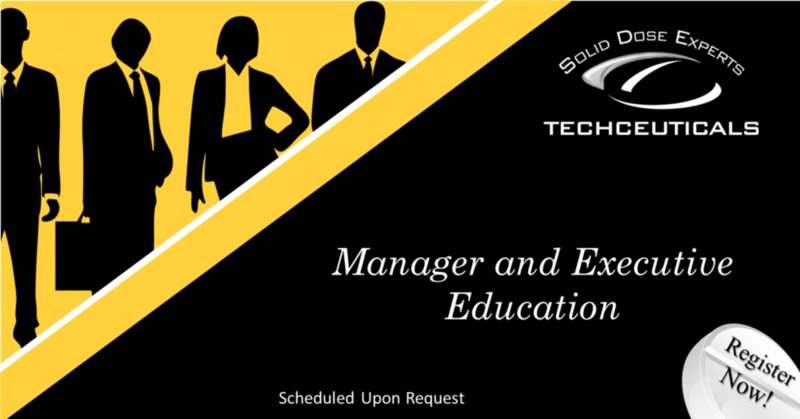 Manager and Executive Education are quick and effective sessions designed to help new or recently transferred supervisors, managers and executives with the detail needed to understand the complete manufacturing and packing environment, designed to improve that bottom line. There are circumstances where learning become tribal, we bring a unique perspective that…. (click to learn more).